The inspiration to “get that monkey off your back” can come in many forms. For some, long term projects come easily; for others not so much for any number of reasons. For University of New Mexico Dean of Students Tomás Aguirre, the inspiration came in the form of simple sock monkey. 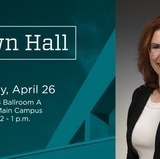 Aguirre has over 18 years of higher education experience with specialty areas in student conduct, residential colleges, finance, assessment, as well as student leadership, development, counseling and advocacy. 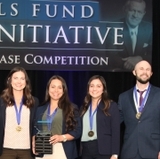 At the time, Aguirre, an El Paso native, was attending the University of Southern California where he earned his master’s degree and struggling to complete his dissertation about “Equity Gaps in Higher Education.” It’s a problem that exists everywhere in the country Aguirre says. 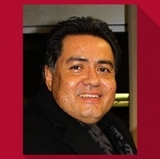 Aguirre himself was a first generation college graduate from a large family. As the story goes, Diego’s great grandmother had a tradition of giving all the grandkids and all the great grandkids homemade sock monkeys. Little did Aguirre know at the time, that Diego had a surprise for his dad that helped provide the inspiration and motivation to help Aguirre finish his dissertation. The next day when Aguirre went back to the computer, Diego had taken his sock monkey and taped the word ‘dissertation’ on the chest and gave his dad his sock monkey. It was his way of helping dad. “It really touched me because up to that point, another part that really frustrated me was nobody really understood what it (earning your Ph.D.) was all about,” Aguirre said. “People understood that you were going to go AWOL on them. The dissertation became a negative thing. My son would say, ‘oh dad, you’re not going with me to the beach today because you’re working on that dissertation. Receiving the sock monkey is only part of the story. The pursuit of a dissertation is a process where sacrifices need to be made. In Aguirre’s case, those sacrifices involved his family. 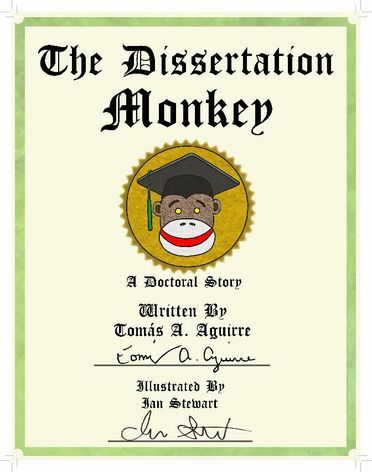 The Dissertation Monkey (Createspace, 2015). While Aguirre was completing the process, the sock monkey became a storyteller. The stories were both positive and negative, and served as additional motivation. Aguirre finally finished his dissertation at Humboldt State, where he had taken a position as associate dean in higher education. He attended graduation with his little inspirational buddy, the sock monkey. After obtaining his Ph.D., Aguirre’s focus was on getting published. Several of Aguirre’s friends suggested he write a book about the sock monkey. He wrote a children’s style picture book about the dissertation process. The book’s main character? The sock monkey of course. The Dissertation Monkey is a beautiful one-of-a kind children-styled picture book for anyone who is or knows someone that is thinking about or pursuing an advanced university degree. When: Thursday, April 30, 2 p.m.
Aguirre wrote a book about the dissertation process featuring his sock monkey. Aguirre created a story board, while a student of his at Humboldt State who was an illustrator, did the cartoon images, which are very colorful illustrations throughout the book. The book essentially tells the story of Aguirre pursuing his dissertation and what it takes sacrifices and all. “Earning your Ph.D. is a really stressful process, and in that image, it’s me and the monkey and we have swords in our hands and we’re battling all these evil monsters that are my dissertation committee,” Aguirre said. Other pictures show his family heading to the beach, the dedication it takes and the support needed from friends and family. Of course, in the end, Aguirre is celebrating with his sock monkey after getting cloaked. Aguirre finally got the book published in 2014 and it’s starting to sell pretty well. Now, he wants to help other graduate students. 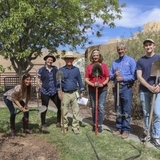 In his spare time, Aguirre enjoys spending time with his family including fishing, camping, hiking, cycling, and any and all university activities and events. And the sock monkey? 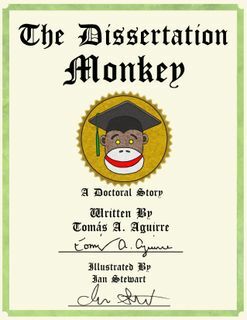 He lives on in Aguirre’s book, The Dissertation Monkey.